That night, it rained. And rained. And rained. The next morning, the bedroom was flooded, so we started to dig a little deeper. The ceiling panels in the bedroom were not caulked to the walls and there was water in the light fixture. We took the light fixture down and water poured onto the floor. My husband started to take the ceiling panel down and ended up dumping a whole lot of water on himself. At that point, we decided to take the ceiling and back wall down. That led to taking the useless corner closet and nightstand out, and, with the closet gone, the floor started to feel like a trampoline with worn-out springs. So, out came the walls and floor. 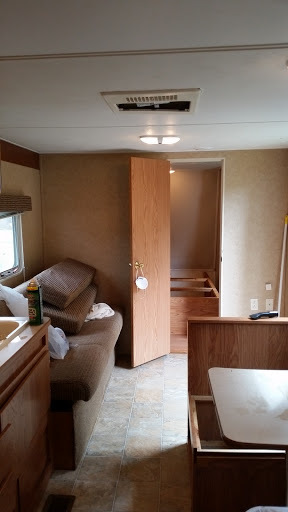 The wall panels did not match the rest of the RV, and we found out that was because someone had simply attached them over the old damaged ones. The floor was the same story. We could wring the water out of the floor joists by hand, and I tore much of the wood out without ever needing a hammer. This was one time when I worked with gloves and a mask. One of the ceiling beams dripped non-stop. The insulation reminded me of old cleaning rags that had fallen into muddy puddles and remained there for years. The more we pulled out, the better everything started to smell! I don’t even want to think about the smell at the start of the process, never mind try to describe it! We purchased a huge tarp from Tractor Supply to keep further rain out, gutted the rotten wood, and set fans up to dry wood that appeared to still be sound. 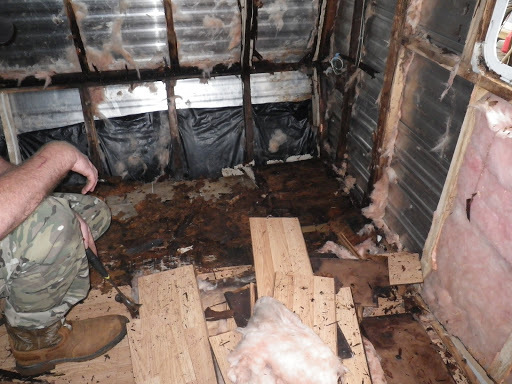 We had to cut some holes in the plastic sheathing below the floor to let the pools of water out. 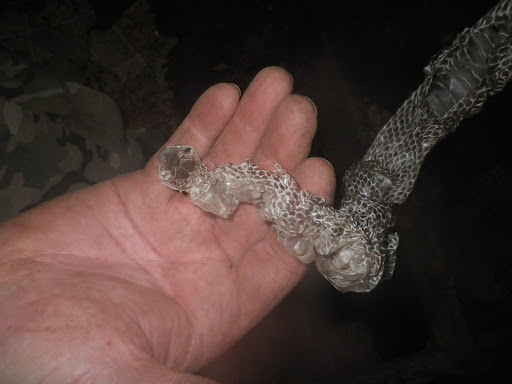 It was clearly not keeping anything else out anyway as we found multiple snake skins under the floor boards. My husband and brother-in-law rebuilt structure and sistered-in support for some of the minimally damaged wood. 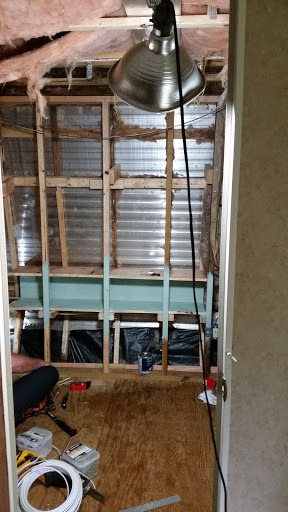 We decided to build the back wall directly on the metal frame of the underlying trailer even though that means the room will end up smaller. 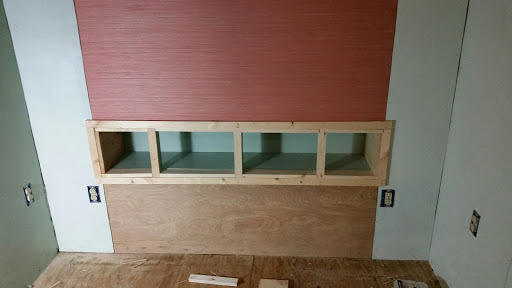 My brother-in-law suggested recessing shelves into the space where the original wall was framed in a lob-sided V.
We now have walls, a ceiling, a floor, and insulation that are almost certainly more sturdy than anything else in our temporary home! We did not get to sleep in our RV this trip, but we did eat one meal there on our new china from Big Lots! It doesn’t matter to me that the meal was actually cooked in my brother-in-law’s kitchen — we had a meal in our house! I left my husband working on the RV today and returned home to grade papers and escape the rain. While it’s rained as much here in Columbia as it did at BIL’s, and even our friend in Missouri watched the creek behind his house come uncomfortably close this week, I have more room to move around and there are many things that I can take care of in the house even when the rain just won’t stop. While we didn’t get to do the things we had planned to do this trip, we do have a place to stay, cook, and shower that we can move to our own land just as soon as the tree thinning is complete. We got to spend time with family, and that is what the farm project is really all about. Did we get frustrated? Of course we did. But sitting here listening to fireworks instead of thunder and rain makes it easier to look back on the things that matter: the camaraderie of working with BIL, the conversations over coffee and meals, and that wonderful moonlit night with stars so clear and bright they almost didn’t seem real.